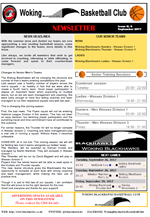 Woking Blackhawks Basketball Club Home Page. Woking started brightly and matched Doncaster's intensity in the first 5 minutes, despite the partisan crowd creating a really favourable atmosphere for the home Eagles. Doncaster rallied after the Blackhawks' initial punch and fought back with strong transitio n offence and perimeter shooting to gain them a 23 point lead going in to the half. The last game of the season and it was left to the youngsters of the squad to host Bristol Storm – and for three quarters it was an enthralling battle that could have gone either way. Many of the senior players were unavailable due to travel , injury and other commitments. The previous week's narrow defeat BY Middlesex inspired the Flyers to start with the same intensity that they had finished with seven days earlier. Dan Marshall opened the Flyers scoring with an uncharacteristic three. Between Dan and Mark Allum the Flyers racked up 16 points to open an early 7 point lead. The speed and tenacity of the early game leaving Cardiff flat footed without a response.